Considering Rice is Nice originally formed as a means to give friends a better platform to release their music and was fuelled only by enthusiasm, it doesn’t seem ridiculous when founder Julia Wilson tells me she’s often surprised when people tell her they like her label. She’s not being overly-modest or facetious – it’s just that over the last ten years, the changing music industry has made it incredibly difficult to emerging labels to get much further than their own immediate circle of friends. However, over these same years, Rice is Nice has proved itself an outlier, and considering Julia’s ability to champion music that is unique, constantly engaging, and always good, it’s less surprising that Rice is Nice has emerged as an institution for DIY Australian music. Ahead of their huge birthday celebration tomorrow night as part of Melbourne Music Week, we had a chat with Julia to find out a little more about the last ten years. TJ: What was happening 10 years ago when Rice is Nice started? JW: I first moved to Sydney from Melbourne in 2007 and became friends with Owen (Penglis). He started Straight Arrows because he was literally getting kicked out of every other band he was in, so he just started his own band. We started a little label called Juvenile Records, and just ran 7”s – we did Black Lips, King Kahn, Straight Arrows, Jay Reatard and stuff like that. We did a co-release for his record Superfrenz, with Brisbane label Valve, but before we did that, we did a 7” called Aminals , with the main single ‘Cats!’ [which was also included on Superfrenz]. That was the first official Rice is Nice release. We’re all kind of a tight little unit. Spod has stayed with Rice is Nice and Straight Arrows have also been on the label since the beginning, and Owen and Brent still work together across their records and give each other advice. For instance, Brent heard the new Straight Arrows’ record before I did. Owen wouldn’t give it to me - he got Brent to listen to it and give him some tips and tracklisting ideas first. Richard In Your Mind is another act that seemed to jump onboard pretty early on – what was happening around this time? That was a real discovery time I guess. I’d heard of Richard In Your Mind but Brent was the one, a real super fan of the band and kind of introduced me to their music. They were just a real local Sydney band, and they were playing a lot, so I knew of them but hadn’t really hard a lot of what they were doing. Brent was just such a super fan, and he mixed their Summertime EP. It just seemed quite different from their first album [which they released on their own] and it just showed me they were capable of doing all kinds of different stuff and an exceptional band, as humans and musically. My Volcano was the first album we did with them and we put a lot behind that - there was just a lot of energy that went into it. We were all just starting – it was just Richard In Your Mind’s second album, Brent was starting doing video clips and producing people’s music, and I’d started doing the records, so it was all really new and exciting for us all at that time. We were all so enthusiastic and throwing so much energy and effort behind it, and it all paid off because we’re all still doing what we were doing then and what we set out to do. It seems like you were building a very tight knit family almost. Everyone so far seems to have stayed on your roster too, I think? There are a few that are no longer on the label but it’s not bitter at all. We’ve all done multiple albums together, but then it gets to a point when it’s like “you know what, maybe you’re better over there because that person or label has more money”, but that hasn’t really happened much. We’re all really great friends, it is definitely a family atmosphere and we’re all very close. I think sometimes it gets to a point where it is a family dynamic and we will bicker a little bit or someone’s frustrated with me or I’m annoyed with them, but its nothing terrible, it’s a passing kind of niggle which makes a real family dynamic in that kind of way. It’s really nice, I feel really lucky to have come across so many artists who are so lovely. They’re all my really great friends and I’d do so much for them and everything they do for their bands, they’re really kind of exceptional and I just kind of mirror that with my support. Did it feel like the label was gearing up and becoming more legitimate at this point? Up until now, I guess we had done stuff with Seja and Shady Lane, and it was friends or friends of friends, but I remember talking to Shady Lane and Jordy who played guitar in Richard In Your Mind, saying “let’s do your record too!” I just remember having this meeting saying “we want to do it, we’re a thing, we’re gonna just keep putting out records”. And then Steph from Summer Flake emailed me, and we didn’t know each, I think I googled her and saw Summer Flake was her band and I just instantly fell in love with it. So that was a cold calling scenario in a way - we had mutual friends, but that was an indication that I was going to start working with people I didn’t know, that it was developing into a legitimate label. We were earning our stripes and people that didn’t know us started wanting to work with us, and I wanted to grow by expanding that network too. I had a bit more confidence to be able to say “I’ll release your record properly” – I had a distributed and probably felt like I knew what I was doing at that point. What have the last few years felt like for Rice is Nice? It feels official and legitimate, but still really exciting. I also think that over the past few years I realised I have to cool my jets and just pick and choose, it was a bit of an epiphany. The whole MO of the label has been to do records and do them really well. I started the label because there were a lot of artists who weren’t on labels and were getting forgotten about, or maybe they were but the job on the release wasn’t so good or they were getting ripped off. I always wanted to do the best job possible, but I realized I can only do that if I have the time and energy to focus on a couple of projects a year. I think I was doing five to ten releases a year [for a while] and just thought “I’m gonna blow it, and that defeats the whole point of the label.” There’s just a shitload of work that goes into it, so I just have to be kind of being more realistic about my time. It’s like “I can’t keep signing bands or I’ll implode”, which is why I started doing the mixtape series as well, so I could get to support and work with bands that I wanted to sign, without having a full on commitment that I couldn’t really manage. So now 10 years in - what are you most excited about at the moment, or what are you excited to go into next? The support I’ve received now that we’re 10 and doing this show has been really validating. People know the label! It still surprises me. Of course they know the bands, I don’t mean to discredit them at all, but I’m just always surprised. I feel like I’m just realizing this now, 10 years later, like “ah cool, people are into this, people are gonna come to shows”. That’s really exciting and has put a lot of wind in my sails. I’m excited to discover more artists. Rebel Yell emailed me out of the blue and I was like “this is so on point to what I’m looking for”, it’s so weird and spooky how she emailed me at that time and it’s exactly what I wanted. That kind of excitement of discovery is top of the list for me, to keep looking out for new bands and to keep having artists surprising me. Also trying to do things a little differently, we have the freedom to do what we want at Rice is Nice, so who knows what we’ll find. Finding out who’s cooking up what in their bedrooms, and hopefully they can share it to me, and maybe that will lead to a bigger roster for the next couple of years, or 10 years and beyond. 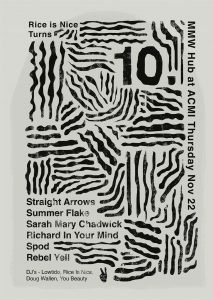 Rice is Nice and Melbourne Music Week are throwing a huge free show tomorrow night, Thursday November 22nd, to celebrate the label’s 10th birthday, featuring Straight Arrows, Rebel Yell, Richard In Your Mind, Sarah Mary Chadwick, Summer Flake and Spod. It kicks off at 6pm at ACMI and is completely free. Rice is Nice Turns 10!